Sir Richard John Evans, FBA, FRSL, FRHistS (born 29 September 1947) is a British academic and historian, best known for his research on the history of Germany in the 19th and 20th centuries, particularly the Third Reich. He was Regius Professor of History at the University of Cambridge until 2014, where he is currently President of Wolfson College. 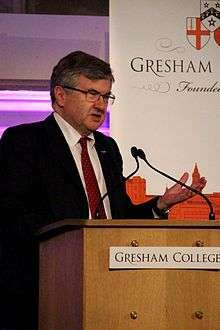 He is also Provost of Gresham College in London. Evans was born at Woodford, Essex, of Welsh parentage, and was, until September 2014, Regius Professor of History at the University of Cambridge. He is President of Wolfson College and Provost of Gresham College. He applied for the distinguished Cambridge position, whereas his predecessors were chosen, marking a procedural change at Cambridge. Evans has also taught at the University of Stirling, University of East Anglia and Birkbeck College, London. Having been a Visiting Professor in History at Gresham College during 2008/09, he was the Gresham Professor of Rhetoric between 2009 and 2013. Evans was educated at Forest School, Jesus College, Oxford (MA), and St Antony's College, Oxford (DPhil). In a 2004 interview, he stated that frequent visits to Wales during his childhood inspired both an interest in history and a sense of "otherness". Evans was knighted in the 2012 Birthday Honours for services to scholarship. As an undergraduate, Evans was much influenced by the History Workshop school, which was in its founding phase at Oxford while he was studying there, and by the English Marxist historians. He was also influenced by E. H. Carr's What Is History?. Evans' main interests are in social history and he is much influenced by the Annales School. He largely agrees with Fischer that the way that German society developed in the nineteenth century led to the rise of Nazi Germany, although Evans takes pains to point out that this outcome was one among many possibilities and was not inevitable. For Evans, the values of the 19th-century German middle class had the seeds of National Socialism already germinating. Evans studied under Fischer in Hamburg in 1970–71, but came to disagree with the "Bielefeld School" of historians who argued for the Sonderweg thesis and saw the roots of Germany’s political development in the first half of the 20th century in a "failed bourgeois revolution" in 1848. Influenced by the New Left, Evans was a member of a group of young British historians who in the 1970s sought to examine German history in the Imperial period "from below". Evans argued that he and his associates wanted to highlight "the importance of the grass roots of politics and the everyday life and experience of ordinary people". Evans argued he sought the creation of a "new school of people's history", which was a result of a trend that "has taken place across a whole range of historical subjects, political opinions, and methodological approaches and has been expressed in many different ways". In 1978, as editor of a collection of essays by young British historians entitled Society And Politics In Wilhelmine Germany, he launched a critique of the ‘top-down’ approach of the Bielefeld School associated with Hans-Ulrich Wehler and Jürgen Kocka in regards to the Wilhelmine Germany. With the historians Geoff Eley and David Blackbourn, Evans emphasized instead the "self-mobilization from below" of key sociopolitical groups, as well as the modernity of National Socialism. In the 1980s, Evans organized ten international workshops on modern German social history at the University of East Anglia that did a good deal to refine these ideas, to pioneer research in this new historical field and, in six collections of papers, present it to an Anglophone readership. Evans' two major research works are Death in Hamburg (1987), a study of class conflict and liberal government in nineteenth-century Germany using the example of Hamburg’s cholera epidemics and applying statistical methods to the exploration of social inequality in an industrializing society, and Rituals of Retribution (1996), a study of capital punishment in German history applying structural anthropological concepts to the rituals of public execution up to the mid-nineteenth century, and exploring the politics of the death penalty until its abolition by the GDR in 1987. In Death in Hamburg, Evans studied the cholera outbreak in Hamburg in 1892, which he concluded was caused by a failure in the medical system to safeguard against such an event. Another study in German social history was Tales from the German Underworld (1998), where Evans traced the life stories of four German criminals in the late 19th century, namely a homeless woman, a forger, a prostitute and a con-man. In Rituals of Retribution, Evans traced the history of capital punishment in Germany, and using the ideas of Michel Foucault, Philippe Ariès and Norbert Elias as his guide argued that opposition to the death penalty was strongest when liberalism was in the ascendancy, and support for capital punishment coincided when the right was in the ascendancy. Thus, in Evans' view, capital punishment in Germany was never a mere matter of law being disinterestedly applied, but was rather a form of state power being exercised. In addition, Evans examined such subjects as belief in witchcraft, torture, the last words of the executed, the psychology of mobs, varying forms of execution from the Thirty Years War to the 1980s, profiles of executioners, cruelty, and changing views towards the death penalty. In the 1980s, Evans played a prominent role in the Historikerstreit. He took issue with the historical work and theories of Ernst Nolte, Joachim Fest, Andreas Hillgruber, Michael Stürmer, Hagen Schulze, Imanuel Geiss and Klaus Hildebrand, all of whom he described as German apologists seeking to white-wash the German past. Evans' views on the Historikerstreit were best summarized in his 1989 book, In Hitler's Shadow. Evans took Nolte—the central target of his book—to task for his defence of the Commissar Order as a legitimate military order; his argument that the Einsatzgruppen massacres of Soviet Jews were a reasonable "preventive security" response to partisan attacks; his statements citing Viktor Suvorov that Operation Barbarossa was a "preventive war" forced on Hitler by an alleged impending Soviet attack; and his claim that too much scholarship on the Shoah has been done by "biased" Jewish historians. In In Hitler's Shadow, Evans strongly criticized Nolte for statements which implied that perhaps there was something to Holocaust denial. In addition, Evans took Nolte to task for his claim that the victors write history, and that the only reason why Nazi Germany is seen as evil is because Germany lost the war rather than because of the Holocaust. In addition, Evans attacked Nolte for claiming that a letter written to Neville Chamberlain from Chaim Weizmann on 3 September 1939 promising that the Jewish Agency would support the war effort was a "Jewish declaration of war" on Germany that justified "interning" all Jews in concentration camps as an attempt to justify the Holocaust. Writing from a functionalist perspective, Evans took Hillgruber and Hildebrand to task in In Hitler's Shadow for their intentionalist theories about the Holocaust. Evans denounced Stürmer for writing a laudatory biography of Otto von Bismarck, which he felt marked a regression to the Great man theory of history and an excessive focus on political history. Evans argued that a social historical approach was a better way of understanding German history. Concerning the attitudes of the German people towards the Holocaust, Evans wrote that he very much approved of Ian Kershaw's conclusion that "The road to Auschwitz was built by hate, but paved with indifference", namely that the German people were by and large indifferent towards the Holocaust. In addition, in his book about the Historikerstreit, In Hitler's Shadow, Evans attacked the historical work of Robert Conquest, Hugh Thomas, Gertrude Himmelfarb, and Geoffrey Elton, all of whom Evans viewed as part of a neo-conservative historical trend. In the same book, Evans endorsed Martin Broszat's call for the "historicization" of the Third Reich as a "rational approach to Nazism" and as a "gain" to history. Though Evans had much to offer in the way of praise for the functionalist arguments of Hans Mommsen, he also wrote of Mommsen's work that "it was surely the case that the argument has now been carried a little too far". One of Evans' most famous works is In Defence of History, a book in defence of the study of history against postmodernist theories that hold the study of history to be outmoded and no longer useful. Evans suggested that the appeal of Holocaust denial had been much increased by the spread of post-modernist theories since the mid-1970s which declare that history is a construct, and that rationalist tradition of the West is a form of oppression. In 2011, he was chided by Peter Baldwin for an approving quote, in Cosmopolitan Islanders (2009), of fellow historian Leif Jerram that "Anglophone societies seem to be fundamentally as interested in the pasts of other cultures as they are in their own". Evans is probably best known to the general public in the role of an expert witness for the defence in the high-profile libel case of David Irving against the American historian Deborah Lipstadt in 2000, Irving v. Lipstadt. Lipstadt was sued for libel by Irving, after she referred to him as a "Holocaust denier" and "an ardent follower of Adolf Hitler" in her 1993 book Denying the Holocaust. Lipstadt further accused Irving of "distorting evidence and manipulating documents to serve his own purposes...[as well as] skewing documents and misrepresenting data in order to reach historically untenable conclusions, particularly those that exonerate Hitler." Evans acted as an expert witness for the defence in the case. His role was to investigate Irving's books, speeches, and other publications to determine whether Irving was, in fact, a Holocaust denier who had manipulated documents to serve his own political interests. Starting in the autumn of 1997, Evans, along with Thomas Skelton-Robinson and Nik Wachsmann, two of his PhD students, closely examined Irving's work. They found several instances in which he had used forged documents, disregarded contrary evidence, selectively quoted historical documents out of context, and mis-cited historical records. Evans concluded that Irving was a Holocaust denier who had twisted and distorted the historical record in order to further his own political ideals; the court accepted this view. Evans proved to be a powerful witness in Lipstadt's ultimately successful defence. The cross-examination of Evans by Irving was noted for the high degree of personal dislike between the two men. Such was the degree of dislike that Irving challenged Evans on very minor points, such as Evans doubting the fairness of a 1938 German plebiscite in which the Nazi regime received 98.8% of the vote. A subject that much engaged Irving and Evans in a debate was a memo by the Chief of the Reich Chancellery Hans Lammers to the Reich Justice Minister Franz Schlegelberger in which Lammers wrote that Hitler ordered him to put the "Jewish Question" on the "back-burner" until after the war. Evans chose to accept the interpretation of the memo put forward by Eberhard Jäckel in the 1970s; Irving chose to interpret the memo literally and taunted Evans by saying, "It is a terrible problem, is it not that we are faced with this tantalizing plate of crumbs and morsels of what should have provided the final smoking gun, and nowhere the whole way through the archives do we find even one item that we do not have to interpret or read between the lines of, but we do have in the same chain of evidence documents which...quite clearly specifically show Hitler intervening in the other sense?" In response, Evans stated "No, I do not accept that at all. It is because you want to interpret euphemisms as being literal, and that is what the whole problem is. Every time there is an euphemism, Mr. Irving ... or a camouflage piece of statement or language about Madagascar, you want to treat it as the literal truth, because it serves your purpose of trying to exculpate Hitler. That is part of ... the way you manipulate and distort the documents." The first volume, The Coming of the Third Reich: How the Nazis Destroyed Democracy and Seized Power in Germany (published by Penguin in 2003), shows how a country torn apart by the First World War, the terms of the Treaty of Versailles, hyperinflation and the Great Depression moved towards an increasingly authoritarian solution. The book explains in detail Adolf Hitler's appointment as Chancellor in January 1933 and how the Nazis transformed Germany into a one party dictatorship. The first volume featured highly favorable words of praise from Evans's friend, Ian Kershaw on its cover. The second volume, The Third Reich in Power, 1933 - 1939: How the Nazis Won Over the Hearts and Minds of a Nation (published by Penguin in 2005), covers the years of Nazi rule between 1933 and 1939. The final chapter examines the road to the Second World War, but the real focus is on life inside Nazi Germany. One of the great strengths of this volume is the way Evans allows small stories of key individuals to illustrate many of the key social, economic and cultural events of the period. Richard Overy described this instalment of the trilogy as "magisterial." In 2008, Evans was appointed Regius Professor of Modern History at Cambridge University. (In 2010 the word "Modern" was removed from the title by royal decree). The post is a royal appointment in the gift of the Prime Minister of the day and dates back to 1724. Previous holders of the title have included John Dalberg-Acton (1895), Herbert Butterfield (1963), Geoffrey Elton (1983), Patrick Collinson (1988) and Quentin Skinner (1998). Evans is the first historian to have to apply for the post and be interviewed by a Board of Electors, including Cambridge's Vice-Chancellor, Alison Richard, and representatives of the history faculty and the university, as well as external assessors from Yale, Harvard, Oxford and London. The board selected a shortlist of four, each of whom was asked to give a presentation to the entire Cambridge history faculty. The shortlist of four was then reduced to two, whom the board interviewed, resulting in the board's recommendation of Evans to the Prime Minister and in the issue of a Royal Warrant for his appointment. As well as serving as Regius Professor, Evans has served as chairman of the history faculty since October 2008; his term of office ended on 30 September 2010. Evans is used to combining administration with research. At Birkbeck College, London, where he worked before Cambridge, he acted as Master of the college when Baroness Blackstone left suddenly to become Tony Blair's first higher education minister. On 27 January 2010 he was elected to the position of President of Wolfson College, Cambridge, to take up office on 1 October 2010. Evans has appeared regularly on a number of TV documentaries related to Adolf Hitler and the Third Reich. He recently appeared on a major TV documentary on the History Channel which examined the Valkyrie bomb plot against Hitler in July 1944, which was the subject of a Hollywood film starring Tom Cruise. As of 2014, he has made 5 appearances on the BBC Radio 4 programme In Our Time. He also appears regularly on "Start the Week" and often writes reviews of history books on his specialist era in major newspapers and periodicals. He is also a noted lecturer and gives numerous keynote lectures at international conferences around the world and also at student conferences as part of his remit to take history to a wider audience beyond academia. He is known as an excellent public speaker and often appears regularly as a keynote speaker at universities and schools and at conferences for academics and students around the world. In 2014, Evans was involved in a debate with Michael Gove, the British education secretary, about the content and style of history teaching and the way that the curriculum is structured and how the First World War should be portrayed. Writing in the Daily Mail, Gove accused Evans in particular of distorting history with regards to Britain's role in the war. Evans countered that Gove was engaging in the defamation of academic historians and "narrow, tub-thumping jingoism". Evans stated that he agreed with Gove's statement about "the ruthless Social Darwinism of the German elites, the pitiless approach they took to occupation, their aggressively expansionist war aims and their scorn for the international order all made resistance more than justified." Evans wrote: "He's [Gove] right about the elites, but misses the point that they weren't able to carry the majority of the German people with them; the largest political party, the Social Democrats, was opposed to annexations and had long been critical of the militarism of the elites". He also ridiculed Gove’s suggestion that the First World War was “just” and fought by men "committed to defending the western liberal order," pointing out that Britain's ally Tsar Nicholas II was far more despotic than even the Kaiser and that 40% of British adult males were not allowed to vote. Evans also wrote that Gove was wrong that only left-wing historians believe that Britain was wrong to fight Germany in World War I, noting that such conservative historians as Niall Ferguson and Alan Clark have been quite vocal in expressing the belief that Britain should have remained neutral in 1914. In Hitler's Shadow: West German Historians And The Attempt To Escape From The Nazi Past, London: I. B. Tauris, 1989, ISBN 1-85043-146-9. 1 2 3 4 5 6 7 8 9 10 11 12 13 14 15 16 Snowman, Daniel (January 2004). "Daniel Snowman meets the historian of Germany, defender of history and expert witness in the Irving trial". History Today. 54 (1): 45–47. Retrieved 9 November 2015. (subscription required (help)). ↑ "Richard Evans: The don who's making history". The Independent. London. 23 October 2008. Retrieved 22 May 2010. ↑ "Queen's birthday Honours list in full". The Telegraph. 2012-06-16. Retrieved 2012-06-16. ↑ Hamerow, Theodore S. (1983). "Guilt, Redemption and Writing German History". The American Historical Review. 88 (1): 53–72 [p. 70]. JSTOR 1869345. ↑ See R.Evans, In Defence of History, London, 2002. ↑ Evans 1989, pp. 33–34, 42–43, 56, 82–83, 184–185. ↑ Evans 1989, p. 83. ↑ Evans 1989, pp. 32–3. ↑ Evans 1989, p. 38. ↑ Evans 1989, pp. 68–72. 1 2 Evans 1989, p. 119. ↑ Evans 1989, p. 124. ↑ Evans 1989, p. 120. ↑ Evans 1989, p. 75. ↑ Guttenplan 2001, p. 290. ↑ Guttenplan 2001, p. 218. ↑ Guttenplan 2001, p. 223. ↑ Guttenplan 2001, p. 226. ↑ Guttenplan 2001, pp. 230–3. ↑ Guttenplan 2001, pp. 230–2. ↑ Guttenplan 2001, pp. 232–3. ↑ Guttenplan 2001, p. 233. ↑ Fulford, Robert (30 January 2001). "David Irving: The Libel Trial Re-Examined". The National Post. Retrieved 14 December 2008. ↑ Overy, Richard. "The Third Reich in Power, 1933–39 by Richard J. Evans". Literary Review (November 2005): 23–24. Retrieved 17 May 2005. ↑ Beevor, Antony (9 October 2008). "The Third Reich at War by Richard J. Evans". The Times. Retrieved 29 December 2009. ↑ Snyder, Timothy (2009). "Nazis, Soviets, Poles, Jews". The New York Review of Books. 56 (19). Retrieved 17 May 2013. 1 2 3 4 5 Evans, Richard J. "Richard J Evans: Michael Gove shows his ignorance of history – again". The Guardian. Retrieved 22 June 2014. ↑ Gove, Michael. "Why does the Left insist on belittling true British heroes? MICHAEL GOVE asks damning question as the anniversary of the First World War approaches". The Daily Mail. Retrieved 24 August 2014.